London's Waterloo Place--a hotbed of polar activity. Episode: 67. Site Numbers: 006, 024, 320, 367, 368. Date Posted: 31 October 1998. Location: London, UK. Type: Statues, Places. Waterloo Place is the elegant termination of Regent Street, John Nash's dramatic piece of urban design that transformed the ancient London of the early 1800s. The home of a variety of memorials, two with polar connections, this rectangular square is also in the heart of 'Clubland' which has polar connections as well. 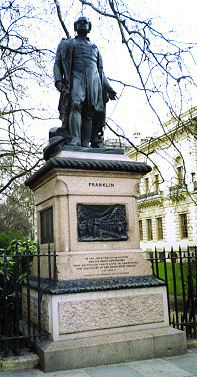 Scott's Arctic counterpart, Sir John Franklin, stands opposite on the west side of Waterloo Place, the two tragic figures eternally contemplating one another across the traffic and possibly sharing thoughts on their respective fates. Sculpted by Matthew Noble in 1866, the standing bronze figure (320) appears in uniform clutching in his right hand a roll of charts. Among the inscriptions and bas relief scenes are the words: "To the great Arctic navigator and his brave companions who sacrificed their lives in completing the discovery of the Northwest Passage AD 1847-8." Actually Franklin was not without Antarctic connections which makes legitimate his inclusion here: He was Governor General in Hobart, Tasmania, and in 1840 welcomed Sir James Clark Ross--then on his way to the Antarctic--and assisted him in the setting up of the Rossbank Observatory. Just as the two polar explorers stand opposite one another, two clubs do as well. 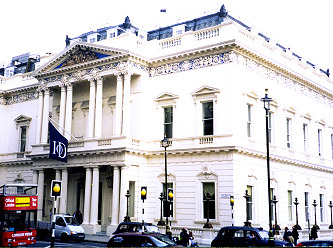 On the east side at the corner of Waterloo Place and Pall Mall and immediately adjacent to the Scott statue is what until 1976 was the United Service Club (367), now the Institute of Directors. It's unclear whether Scott was a member though it seems likely as he wrote from the Club on June 11, 1900 to the presidents of the Royal Society and the Royal Geographical Society acknowledging his appointment as Commander of the National Antarctic Expedition. 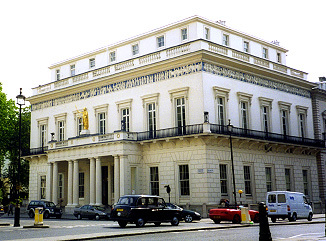 On the opposite corner, near to the Franklin statue, is the Athenaeum (368), which unlike the United Service is still very much alive. This "the most intellectually elite of all London's clubs" hosted a farewell dinner for Scott and his officers on July 23, 1901. Albert Armitage recalled in his book Cadet to Commodore that "it was the first dinner of its kind ever given in the famous club."